"GREENSBORO, NC — The senior class had such great experiences during its four years at Bennett College that they wanted to leave a symbol of their experiences for other classes to enjoy. Members of Bennett College Class of 2016 commissioned Khyri Headen Crawford, a recent fine arts graduate of North Carolina A&T State University, to paint a mural that is located on the lower level of the David D. Jones Student Union Building. According to Jasmine Everett, president of the senior Class, there are elements of the mural that represent different facets of the Class of 2016. When the students enrolled in 2008, Obama’s slogan of “Yes We Can,” resonated with the young women. 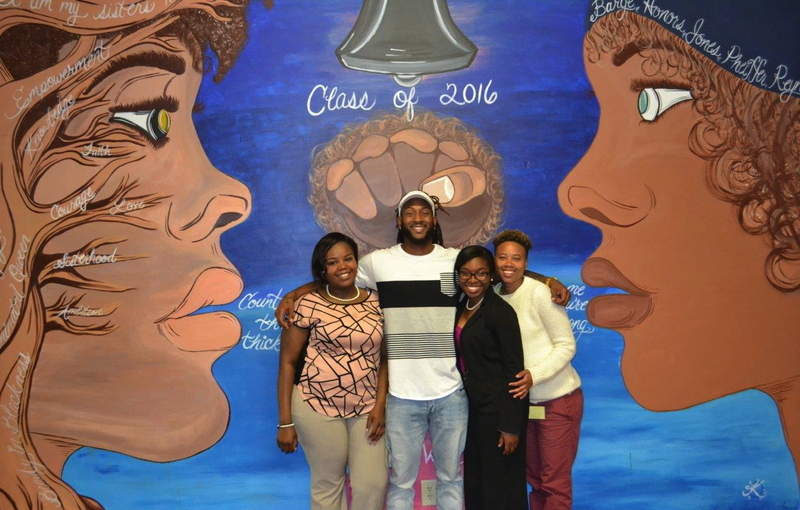 The young girl in the mural represents the mentoring that takes place between students, the community and alumnae. The Afro puff in the young girl’s hair represents the “Black Lives Matter” movement. The mural also includes lyrics that have been included in the seniors’ class song. The mural also includes the names of the residence halls that were open during their first year and descriptive words highlighting the characteristics of the Class of 2016. The commencement for members of the senior class is scheduled Saturday, May 7, 2016, at 10 a.m. in the Quadrangle at Bennett College."